Taipei Reaffirms Sovereignty over Diaoyutai, Finally! The ROC government in Taipei has reaffirmed its sovereignty over the Diaoyutai Islands, finally. For the past 20 years, Taipei has allowed Japan to get away with behaving as if the Diaoyutai Islands (in Hanyu Pinying), or “Tiaoyutai Islands” (in Wade-Giles), and the territorial waters surrounding it, belonged to Japan. For eight years, Chen Shui-bian has never made a peep when Japanese warships drove Taiwan Chinese fishing boats from Chinese territorial waters. During his 12 years in office, Chen’s predecessor Lee Teng-hui was even worse. Lee openly and explicitly declared that Diaoyutai belonged to Japan! Now however, three weeks into Ma Ying-jeou’s term, a incident that during Lee Teng-hui’s term or Chen Shui-bian’s term would have been swept under the rug, has brought the issue of China’s sovereignty over Diaoyutai into the spotlight. Now, finally, we have an opportunity to get at the truth. TAIPEI, Taiwan — Taiwan reaffirmed its sovereignty over the Tiaoyutai Islands for the first time in at least ten years yesterday, two full days after a 270-ton sports fishing boat sank in a collision with a Japanese maritime defense frigate over their waters. President Ma Ying-jeou, once a Tiaoyutai warrior, had a statement issued by his spokesman Wang Yu-chi reaffirming the eight islets, some 120 miles northeast of Keelung, are part of the territory of the Republic of China. No official statement on the Tiaoyutais has been made over the past ten years, and it seems that Taipei has tacitly given up sovereignty over the small archipelago, which the Japanese call the Senkaku Islands. China, along with Taiwan and Japan, claims sovereignty over the islets under whose waters lie vast natural gas and oil reserves waiting to be tapped. The islets are designated as Daxi li (ward) of Touzheng Township in the county of Yilan, the statement declared. “We also demand Japan release the skipper at once and pay compensation,” the Office of the President said. “The Ministry of Foreign Affairs is negotiating with the Japanese side on the basis of the above-mentioned principle,” it added. As an aside, Wang Yu-chi said in releasing the statement there never is a change in President Ma’s strong determination to safeguard Taiwan’s sovereignty over the Tiaoyutais, which is spelled Diaoyutais in pinyin. China uses that name. “He was a hot-blooded youth,” Wang said of President Ma when he spearheaded the campaign to protect the Tiaoyutais in the early 1970s. At that time, Ma said he would risk going to war with Japan to safeguard the eight islets. “President Ma is a hot-blooded middle-ager now,” Wang said.When the dispute over the sovereignty broke out while he was mayor of Taipei, Ma criticized President Chen Shui-bian for not standing up against Japan. Wang explained Ma did not respond immediately to the incident, in which none were wounded, because as head of state, he had better let his Cabinet take care of it. The fact, however, is that the public reacted too strongly for the president and his foreign minister to appear like pushovers. There were 13 sports fishermen along with a three-man crew aboard the fishing boat Lien Ho. They were all thrown overboard in the collision Tuesday morning, but were rescued by the Japanese patrol ship Koshiki. They were all taken to Ishigaki jima, one of the southernmost isles of the Ryukyus. The 13 deep-sea anglers were released later and came back to Keelung aboard a NCGA cutter Wednesday. Two crew members flew back to Taipei from Okinawa yesterday morning. Chou Hsi-wei, magistrate of Taipei, accompanied Mrs. Ho Hung-yi, wife of the Lien Ho skipper, in meeting with Premier Liu Chao-schiuan, who promised whatever possible government help to get her husband back as soon as possible. Liu said he instructed the foreign ministry to demand that Japan release the skipper, make compensation, and apologize for the incident. The magistrate of Taiwan’s most populous county, which has jurisdiction over Juifang, the home port of the Lien Ho, went to the Taipei office of the Interchange Association, Japan’s de facto embassy, to lodge a protest. There was a crowd before the Japanese office protesting against “the arrogant bullying” of the Lien Ho crew and sports anglers. Lawmakers of both the ruling and opposition parties unanimously condemned the foreign ministry for buckling under Japanese pressure. Democratic Progressive Party legislators demanded that Francisco Ou step down as foreign minister to take responsibility. “Where’s the hot-blooded youth called Ma Ying-jeou now?” asked Yeh Yi-tsin, DPP legislative caucus deputy whip. Kuomintang lawmaker Lin Yu-fang demanded that Chen Chao-min, minister of national defense, be prepared for war. His colleague, Chang Suo-wen, charged the foreign ministry with ordering the NCGA cutters to stay away from “the Japanese territorial waters,” precluding their timely assistance to the Lien Ho. “We should all go to the Taipei office of the Interchange Association to protest,” Chang urged. Phoebe Yeh, spokeswoman for the foreign ministry, denied any such order was issued. But she admitted the cutters were told to stay 12 nautical miles away from the Tiaoyutais. 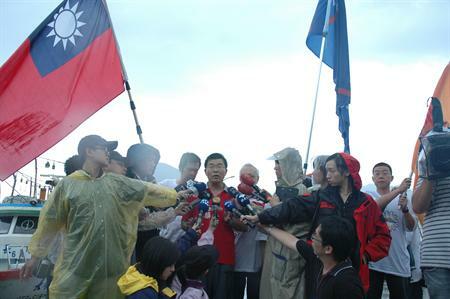 Tsai Ming-yao, a foreign ministry Japanese affairs coordinator, said he was to blame for telling the cutters to stay away. A note to the Ministry of Foreign Affairs. The Republic of India is India. The Republic of Korea is Korea. The Republic of China is China. Whether to refer to the visits of foreign guests as “visiting Taiwan” or “visiting China” involves sensitive domestic political considerations. Such decisions ought to made with care. It is unlikely that Ou made such a policy decision by himself. Minister Ou said, “Calling a halt to this change was my personal decision.” Does that mean the original decision was also the Minister’s personal decision? Both foreign and domestic policy decisions ought to be made be in accordance with certain standards. Rapid flip-flopping on major policy decisions can only undermine the Minister’s crediblity and damage the Minister’s prestige.